Denmark was the lead power during its centuries long union with Norway and as most arms manufacturing was in Denmark boarding axes of this period would have been used on Norwegian as well as Danish ships. Norwegian axes produced after the separation in 1814 are described on the Norway page. 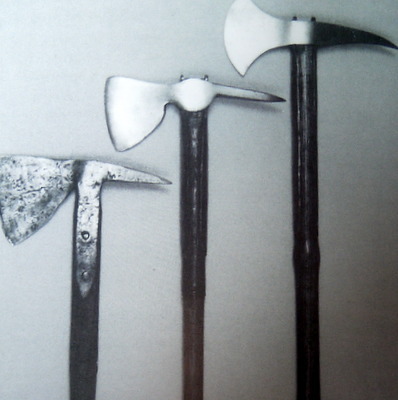 There were in general 3 models of Danish Boarding Axe. The first was in use from the 17th and throughout most of the 18th century. Model 1 was a bearded axe with integrally forged side langets that came in various sizes with minor variations in shape, with some examples being crudely made. Peterson and Gilkerson identify the earliest surviving example in the Tojhusmuseet in Copenhagen. However this axe is so well marked with the date and the royal cipher that it is most probably a pattern model or even a presentation axe, possibly even for the king. Christian V was known to have an interest in maritime matters. Model 1 was retained for over 130 years until a Model 2 was introduced around 1780. This had a slightly smaller blade with sharper curve at the chin and a finer spike, straight but angled downwards. The main change was a switch to separate front and rear langets which passed through and ended in a T shape above the head similar to the French design. Front and rear langets remained the norm until the boarding axe was phased out in 1865. Large numbers of these axes were made in 1807, presumably to make up for the losses incurred after the British assault on Copenhagen in that year, and the looting of the arms stored there. 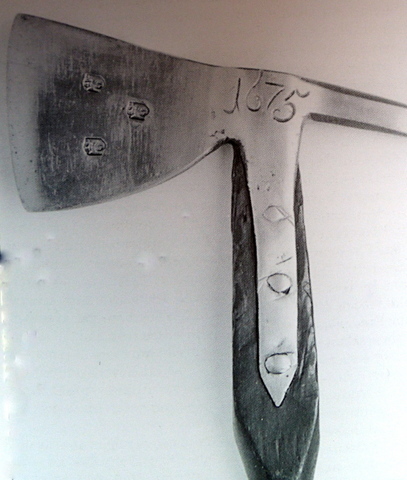 The final Danish axe, Model 3, was introduced in 1810. The blade is elegantly flared and the spike is longer with a gentle downward curve. It is thought that this axe was produced in both Norway and Denmark. It is not known whether it was a pattern or a presentation axe made for a special purpose. It is dated 1675 and marked with three crowns in cartouches on one side and three C5 (King Christian V) on the other. No other example of a dated boarding axe is known until the 19th century. Some of these axes were crudely made, using the simpler construction method of incorporating the side langets into two plates and forging them together, similar to early British models. This can be seen in the picture below. After a review in 1802 many of these axes were re-shafted with new handles of shorter length. As these axes were gradually replaced with newer models and withdrawn from service some of them were re-used ashore in fire services and may have had handles further shortened. 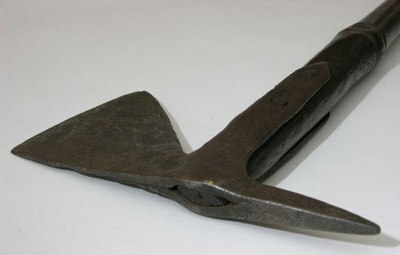 The Model 2 was manufactured from 1780 and retained the bearded blade shape, but had front and rear langets which were then used in all future axes. Quality and consistency were much improved over the earlier model. Those manufactured at the factory at Fredericksværk are sometimes marked with a crowned F after 1804. The one pictured above shows the crowned F in an oval cartouche next to the ‘16’ but is indistinct in the picture. This is the last boarding axe to be issued in Denmark and it also saw service in Norway. Peterson describes it as…’ den meget smukke entrebile’… and even though this example is a bit rusty we can see why. It is beautifully proportioned with flared blade and gently curving spike. Front and rear langets are long, reaching almost to the middle of the shaft which has a swelling at the centre and again at the end. This Model 3 Danish axe has some similarity with earlier Swedish models.